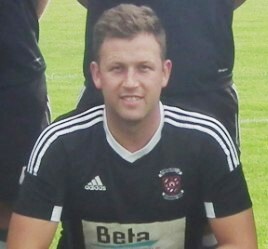 Shane Clarke left it to the last chance in the last game of the season to clinch the Premier League’s top goalscorer award with 44 goals, pipping his team mate Keith Mawdsley by one goal. Eight goals in his last three games saw the Country’s top striker overturn a five goal lead held by his strike partner and makes it seven seasons in a row that Clarke tops the scoring charts in Limerick. All but four of Clarke’s tally were against Premier opposition. 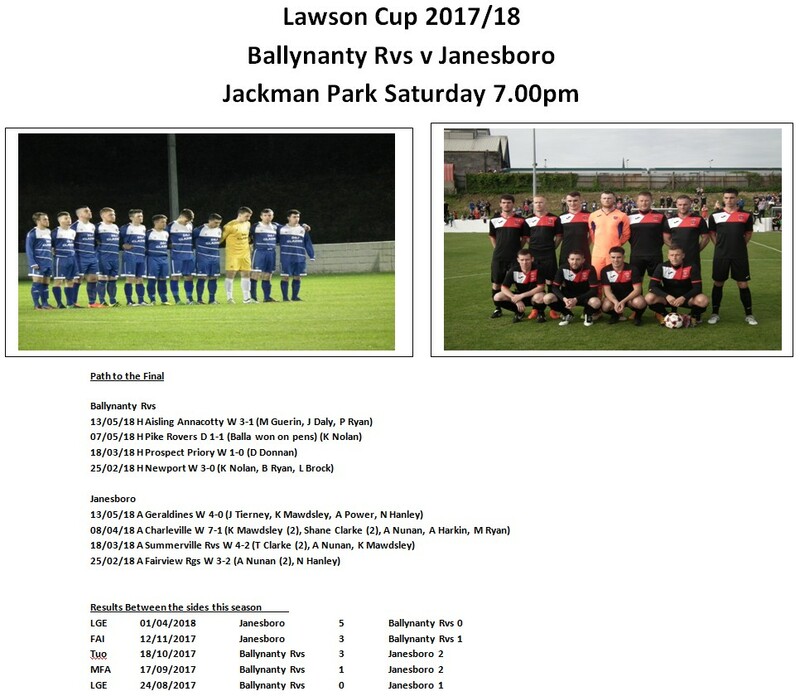 Saturday evening’s Lawson Cup final between Ballynanty Rvs and League champions Janesboro will bring the curtain down on a thoroughly enjoyable season. Congratulations to all winners and participants who can now enjoy a well earned break. 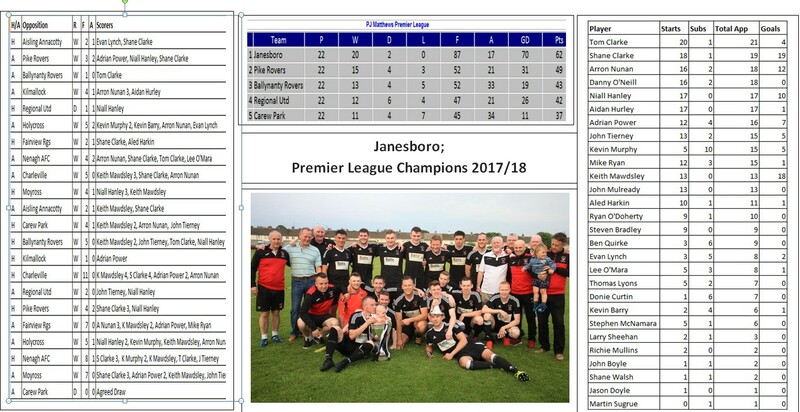 While Janesboro’s retention of the Premier League and Pike Rvs exploits in the Munster and FAI Cups will attract most attention, there have been numerous stories of glory and enjoyment right through the 13 Divisions. Hopefully Saturday’s game will be a fitting finale to the season. Our Second Annual Awards Night proved a very successful event and once again thanks to all who made it possible. 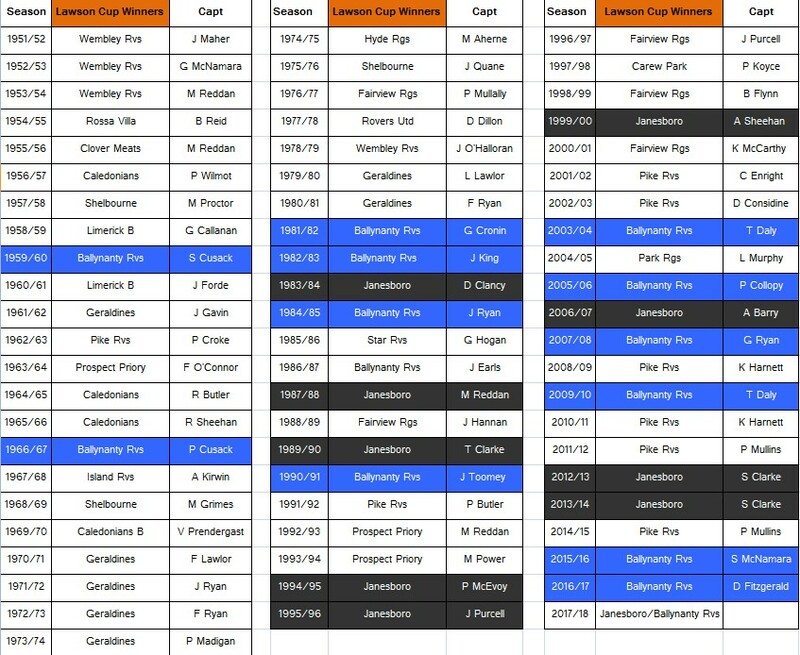 Our Website “www.limerickjuniorsoccer.com” was attracting 80,000 hits per month as the season drew to a close and once again I am open to any suggestions to improve the service or “IT” advice to spruce things up. As usual a big thank you to all the Club PRO’s and obliging players or officials that I drove crazy over the season. You patience and generosity is greatly appreciated. Special thanks to Turlough McNamara who took me out of a hole numerous times over the course of the season. Don’t forget Friday’s Schoolboy History Book Launch in the Janesboro Club. Sean Curtin, Buddy Brennan and Gerry McCormack have compiled a must have publication and deserve a good turnout. Stay safe over the Summer and enjoy the rest.